No workshops are being planned for the immediate future, but we'll update this site if/when that changes. Our apologies. In the meantime, Toronto WordSmiths is starting up. It's free, on Thursday nights at the Parkdale Library, and led by several long-time TSW participants. More information is available on Facebook. On Monday, July 1, at 7 pm, the Toronto Street Writers present a mind-blowing evening of performances, readings, music and art. We’re also launching our new zine, What We Didn't Know Existed, bursting with stories, poetry and art by this year's street writers. Plus delicious food, cake, and way too much inspiration and fun to be contained in one space! Sponsored by Canada Council for the Arts, Ontario Arts Council, Toronto Arts Council, Ontario Trillium Foundation and Canadian Heritage through the Celebrate Canada Fund. We Made a Zine in Two Hours! 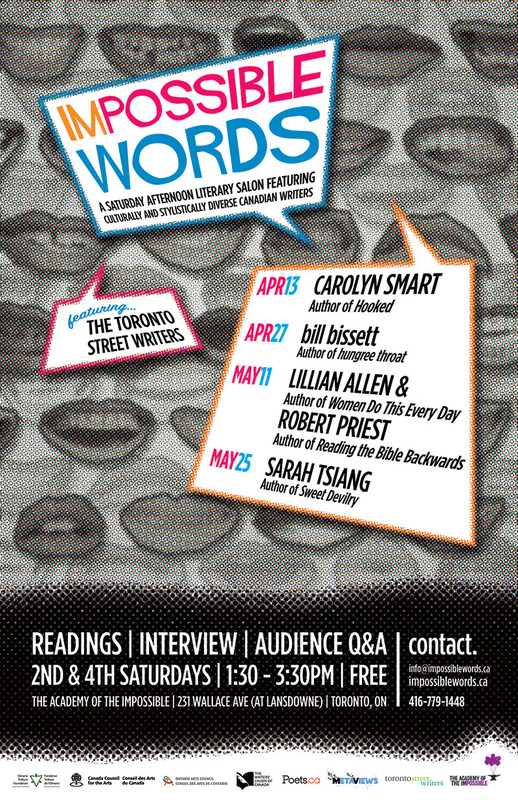 Toronto Street Writers has a new sister program, Impossible Words. The twice-monthly literary salon runs out of the Academy of the Impossible. It pairs up culturally, stylistically and geographically diverse Canadian authors with young writers on stage for a raucous conversation and a lot of fun. Registration for the new year of Toronto Street Writer is almost at capacity! But drop us a line at info(at)torontostreetwriters.ca if you're dying to sign up. We've got a full calendar of guest authors, writing prompts, and discussions lined up. See y'all very soon! Launch for TSW zine West of What We Know! Open Book Toronto ran a series of interviews with participants Krystle McKenzie, Richard Chang, Rob Saffrey, Jenna Anne Kennedy and Caleb Trudeau. An online article at Toronto Is Awesome about the Toronto Street Writers and the event. An Examiner article about the writing group and the event. Here are a few choice shots of the Street Writers party and launch of our new anthology of writing, West of What We Know. All photos credited to Ryan Singh. Once again, we especially want to thank our sponsors: Canadian Heritage though the Celebrate Canada Fund, the Canada Council, Ontario Arts Council, Toronto Arts Council, Lakeview Lunch, Chapters-Indigo Eaton Centre and Penguin Books. The Toronto Street Writers launched their new anthology of writing and art by inner-city, West of What We Know, on Sunday July 1st, 2012 at the Academy of the Impossible in Toronto's west-end. The event featured readings by young poets, hip hop lyricists, playwrights, and short story writers whose work appears in the anthology. In celebration of the Queen's 60th Jubilee, there was an impromptu crown-making workshop where audience members will be encouraged to express what the monarchy means to them. The Street Writers are a celebrated group of young writers from many different cultures and walks of life across the city. The group meets weekly, ten months out of the year, and is coordinated by award-winning local author Emily Pohl-Weary. Young writers work with professional authors, musicians, artists and screenwriters to generate the skills and confidence needed to express their realities, process difficult experiences, and pursue careers and professional opportunities in the arts. West of What We Know is the fifth annual anthology of youth writing that the Street Writers have published. Underground Inspirations: A Street Writers Zine Launch! Launch of new work by the Parkdale Street Writers! Plus: Special guests Rose and Nic from LAL and Abstract Random! Do you want to MAKE YOUR OWN FILM? Do you love MOVIES, TELLING STORIES and PERFORMING? make in their own short films!